Enterprise Content Management is the management of structured information of data, documents, emails, people, contacts, discussions, negotiations, drawings, graphics, etc..
Its objective is not the editing of documents, but in its most basic form it is the replacement of traditional filing systems, but with the advantages of modern technology. 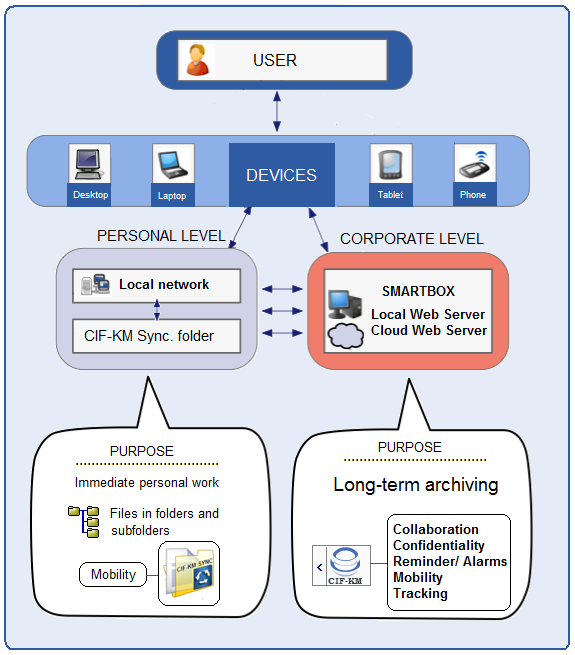 A person can work saving documents to his own local disk or in a network server by means of a system of classification in folders and subfolders, and may also use a storage folder in the cloud (eg Google Drive, Dropbox) to save files with which he/she is working, for MOBILITY and to manage mobile devices. However, a company cannot retain the information generated by its staff over time (thousands upon thousands of documents and records) with only a system of folders and subfolders that many people may access. The system is unmanageable. The folders will fill with old material, grow in number, and the track (path) of the files will be lost. That not only all texts are indexed, but in it the context related to each matter can also be monitored and recorded, so that one can retrieve contents with multiple filters. THIS SYSTEM CAN BE CIFKM, which is essential for the company to gain in efficiency and productivity. Many companies have abandoned their traditional filing systems, but do not yet apply advanced solutions for sharing, privacy, and later location. 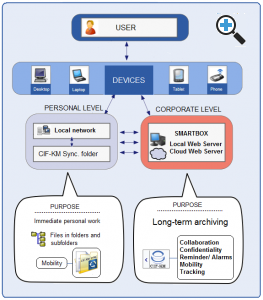 In them the information contents, although they may be critical to the business, very often are scattered in local networks, emails, and in the PCs of the users. Thus, they are often difficult to locate, especially when one isn´t aware of their existence, people change, or one does not remember where they were saved.